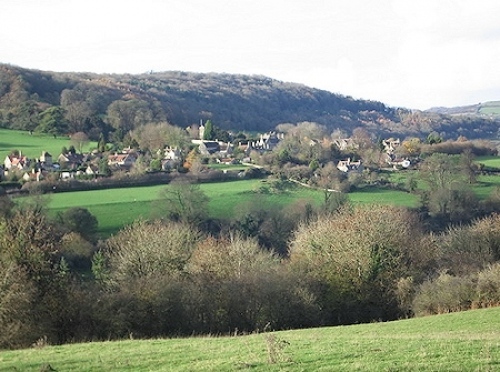 A tiny rural civil parish village called Claverton in Somerset, which is home to around 115 people (70 homes) and resides near Bath in England, has apparently become the first such UK village to privately co-fund with BT to build a completely new “fibre broadband” (FTTC) network. Unfortunately BT has refused to tell us how much the community itself contributed to the project, which is apparently deemed commercially confidential, although the operator did say that almost every household in the village made a contribution. Similarly we do not know how much BT itself contributed, although the project was probably quite expensive. As part of this effort engineers from BTOpenreach installed 2 kilometres of underground ducting and 4 kilometres of overhead and underground fibre optic cable, including two new roadside street cabinets. Just to be clear, one of the cabinets was a bog standard one for pure copper ADSL + Phone services and the other was used to deliver ‘up to’ 80Mbps Fibre-to-the-Cabinet (FTTC) technology. Prior to the work it’s understood that most locals were only able to receive broadband download speeds of less than 1Mbps (Megabits per second) and thus the new connectivity has delivered a significant boost to the community, which clearly didn’t want to wait and see if the Government’s Broadband Delivery UK programme would ever get around to them. “We realised the high costs involved meant Claverton would not be upgraded as part of BT’s normal commercial fibre broadband roll-out for some time, so we set about working with the company to jointly solve the problem. “The people of Claverton are true national trail-blazers and are setting the pace for rural communities through their collaboration with BT. They have worked tirelessly with us to turn this ambitious project into reality. Their enthusiasm and commitment is infectious and we’re pleased to have worked in partnership with them. Apparently locals are now also clubbing together in order to provide WiFi at the village church so that, in the absence of a village hall, it can play a greater role in community activity. It’s of course possible to read this story in one of two ways. On the one hand it shows that BT has the capacity to adapt and deliver a useful service by working with a very small community, but on the other hand it’s arguably a bit sad that the community felt it had no other option than to donate money to get better broadband. One of our readers noted that some estimated details for the project’s cost were actually made public and after some digging we found a related 2013 document from the Claverton Parish Council (it’s always nice to breakdown those secrecy barriers). At the time this is what they said. Cllr Sykes updated the Parish Council that the Claverton Broadband working group have now received the draft engagement offer from BT Openreach for the installation of the necessary cabinet equipment to enable the upgrading of the Broadband service to the village to Infinity (superfast broadband). The required community contribution cost is £40,081 exclusive of VAT. VAT at 20% will add a further £8,016 to the cost. The total cost including VAT is £48,097.20. This is a fixed price contract, providing it is accepted within a 60 day period. If the contract is signed by the end of August BT will also commit to the project being completed by May 2014. It’s worth pointing out that the final cost may have changed since then, not least because Openreach was in discussion with HMRC as to the necessity of charging VAT on projects of this type. The LA must have planned a technical solution for upgrades to the area such that everyone there could get at least 2Mbps by the end of this year, in line with the BDUK programme. Was there a veil of secrecy about it which meant that the inhabitants were unable to find out the details of the planned solution and now, lacking any confidence in the LA, have paid twice, first through their taxes and then second, through their direct contributions? Now, the LA money that was already earmarked to upgrade that area can be put to use somewhere else. I have some sympathy with them for being forced into this situation, but now they’ve paid twice – once through their taxes, for which they received nothibg, and and again by paying directly. I wonderif BT made them all sign non-disclousre agreements. If there is not enough funds for 100% maybe people would like to propose areas that will not be covered. See clause 3.83 – page44, BT makes no capital contrubtion to any BDUK project for three years. And this report pretends there is only £750m of state funding when phase 1 alone is £1.2bn. It reports BT of a simple of £32k BT bid cost against the £750m – which needs re-stating given Phase 1 funding is £1.2bn alone. So we now know total cost and we know BT invests no capital for 3 years. So we can confirm BT could not spent £2.5bn on 50k commercial cabs. Let’s guess at the co-funding? £35k minimum! If there were not enough funds to provide everyone with 2Mbps+, why did BT sign a contract to provide everyone with 2Mbps+? What was the penalty for breach of contract to be, as set out in said contract? So, if I understand correctly, in order to achieve the BDUK project goals, the LA effectively went into an implied partnership with BT. Who said “We’ll do these bits, you pay for those bits” to achieve set goals, one of which was 2Mbps+ for everyone. How far the village is from the cabinet is irrelevant. VDSL is but one possible solution in some circumstances. Having then trousered the contract BT then consider it acceptable to imply that the village somehow made itself inaccessible, perhaps by growing legs and walking a few km from the cabinet, and now it can’t be done, so more taxpayer’s money, please? The BDUK process is so badly flawed it’s negligent. How come it wasn’t in the “intervention area”? My Council definition of intervention areas are only for those where they intend to uprate the cabinet to superfast. For the remainder coloured white on the map it is case of either you are already above 2Mbps so we are doing nothing or you are below that in which case we will do something but what that something is has not been stated. The differences between these latter two cases is not shown on the map. So in the analysis of this car-crash project, then, this village would have been in line for upgrades under BDUK by the end of this year because residents can’t get 2Mbps+. So when BT were contracted there would necessarily have been a plan to deliver this, unless the LA were negligent and deliberately planned for project failure. So by the end of this year, this village would have been upgraded under BDUK anyway like every other similar village in the country below the minimum speed will of course be. This must have been planned. If it wasn’t, there’s some serious negligence involved either from the LA, or BT. Otherwise, we have project failure. So assuming we’re not coasting towards project failure, why didn’t the LA simply communicate what the plan was? @Fastman2 – £40k + VAT I was out by £5k so I hope it is 1Km of new duct. It is essential £2.5bn is re-stated. It is not whining. It is a signficant in whether Openreach is being boken or not. Absolutely ridiculous. Maybe people should also propose areas which have no electricity, no roads, etc ? All they had to do was invite an altnet in, then bt would have funded it themselves. In B4RNland they are deploying copper and ‘fibre’ cabinets in our tiny villages of less than 20 homes. Double the cost when it means they have to put the PCP cab in as well as the so called fibre one next to it. A superfarce. The bigger villages would love the chance to have superfarce, but BT won’t go there until B4RN says they are going there, and then plans mysteriously change. Competition is all you need. I think these folk at Claverton have been conned, because they haven’t got fibre broadband, they have got a stop gap solution, and those further from the cab won’t be any better off, so they will be surrounded by little notspots that aren’t economic to provide for by altnets. If an altnet had got the whole village the job would have been done right, and all the outlying places could have been helped too, whereas now they have settled for copper they are stuffed. Well done to the snake oil salesman, he’s really good at this. there are a vast number of villages being excluded from bduk due to supposed alntet presense where community will have no choice — i cant count the number of villages i have been involved in where villagers have told me im going to have 1 gi each in the village and every one wil have that all of the time !!!! I know several cabinet areas and even one whole exchange where that well known altnet came in and BT has in ALL cases done NOTHING. So they have left the area on ADSL – effectively abandoning it. In fact on the MSE “phones” sub-forum at the moment there is a resident of some village outraged at precisely this result. They they have no intermediate choice. They can either have BT ADSL at a bare 1Mbps or Gigaclear at 50Mbps at a price they cannot afford: again there BT have done NOTHING in response. Secondly I can assure you that any outlying small groups of houses remote from the village are NOT covered by the above altnet unless the house group themselves pay a contribution to getting the fibre to them: “excess construction costs” they call it. These altnets are profit driven commercial groups and are not dedicated to universality of access. What you have to look at with altnets is the nature of the connection. If it is a choice between adsl and nothing then you make your choice. If you have to pay through the nose to get FTTC from openreach it is a waste of your money. Gigaclear are providing a futureproof connection, so its worth the effort. Do the job once and do it right. Cabinets are a stop gap. They are a dead end, and yes, some folk will be very happy with the service for now, but many are too far away from the cabinet. Cabinets are a stop gap, or dead end? Which is it? You said its both. Do we know that the parish council didn’t invite an altnet? There are other examples where this has been done and the village in question has still gone down the Openreach route. Sometimes that’s based on having a choice of ISP, the time taken to deploy and the aesthetic impact of some of the fibre installs. Chris – any decent altnet would have spotted the opportunity. ‘those further from the cab won’t be any better off’ So you know the area? Care to explain what you mean by “decent altnet”? Who are they? Links? The required community contribution cost is £40,081 exclusive of VAT. VAT at 20% will add a further £8,016 to the cost. The total cost including VAT is £48,097.20. It’s from an old council document, going to update. This was a similar cost to the one BT quoted our village of a similar size. Ditto for us but we decided to wait for the SEP funding rather than pay twice. 2014? Is this old news? I think you missed the context. That quote comes from the early planning stages in 2013, as stated above. Clearly, given the above news, it took them a lot longer to complete the build than initially anticipated (about 12 months longer) or somebody got the year wrong. Fastman2 – apologies 2 kilometers of underground, and 4 kilometers of overhead – should be saluted. CDS could have paid, but we now know BT contributes nothing until 3 years after contract signature. @NGA – does anyone else confirm your understanding? @The Facts No one disputing that point which is pretty much how the truth is emerging – slowly. The only proxy for a possible BT contribution is the intervention levels which would amount to £570m against the £1.2bn phase 1 subsides. This is against the £751m referenced in the 43/4 press releases for a BT contribution, which includes operational costs. The Oxera report also references BDUK are expecting £26Xm less investment from BT, which was also reported in first NAO report. Given BT can accumulate non-allowable costs, self-certify and re-balance costs in the next three years, then they pay nothing apart from claw-back based on takeup. Hence my alarm when I saw no reference in the accounts to a capital contribution. Until I saw cl3.83 I assumed they might pay £50 a customer passed in kind, but not now. Oxera report dealt with a lot but chickened out of dealing with the consequences of £1.2bn subsides and only referenced £780m, hence these bid prices references are understated by at least £10k a cabinet. They do not reference USC funding either. But getting 3.83 on record might eventually help if you can find a bureaucrat or MP interested.